Uncategorized | Ross Environmental Services, Inc.
On March 29th, Ross Incineration Services, Inc. surpassed five years without a Lost Time Accident (LTA)! Reaching this LTA milestone displays the tremendous effort RIS associates put forth every day to mitigate the risk inherent to what we do. RTS Truck Driver Mark Hewitt (left) and RTS President Bill Cromling III (right) at the ATA National Truck Driving Championships. Join us in congratulating Ross Transportation Services, Inc. (RTS) Truck Driver Mark Hewitt on competing in the 2018 American Trucking Association (ATA) National Truck Driving Championships August 15th-18th! Mark finished the ATA National Truck Driving Championships in 18th place, an amazing achievement considering that he went up against over 430 of the best-of-the-best professional drivers from every U.S. state, Canada and Mexico. He qualified for the national championships after taking home the first place trophy in the Sleeper Class during the Ohio Trucking Association (OTA) Truck Driving Championships May 18th-19th. RTS General Manager Chris Fada said he could not be any prouder of Mark’s dedication and commitment to safety, excellence and upholding the values of the Ross Group of companies. RTS President Bill Cromling III, who was able to attend the event, was also astounded with the level of proficiency displayed at the championships and called it an honor for Mark and RTS to be represented among the best in the business. Over the last four years, Ross Incineration Services, Inc. associates processed over 628,000,000 pounds of waste while not only protecting themselves but also their co-workers, neighbors, community and environment! It is through the Ross Group of companies’ continual improvement culture and our associates’ commitment to safety that RIS has been able to achieve all this and more. Congratulations Ross Transportation Services, Inc. (RTS) truck drivers Dave Teleha, Mark Hewitt and Dan Kobida who competed in the Ohio Trucking Association Truck Driving Championships May 18th-19th. This marks Teleha’s third year, Hewitt’s 13th year and Kobida’s first year competing and representing RTS in this competition. This year, there were over 200 competitors who underwent a written exam, pre-trip inspection practical and driving course in hopes of snagging the first place trophy. 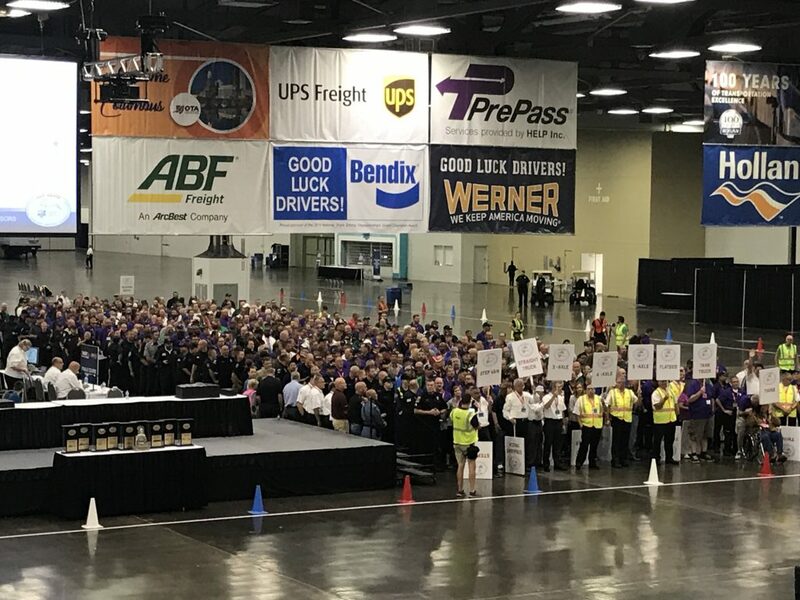 The competition was judged by dozens of Ohio State Highway Patrol Troopers, Federal Motor Carrier Safety Administration (FMCSA) Inspectors and Public Utilities Commission of Ohio (PUCO) Inspectors. Additionally, and for the first time ever, RTS will be sending a driver to the American Trucking Association National Truck Driving Championships! That driver will be Hewitt who took home the first place trophy in the Sleeper Class. This will be his fifth trip to Nationals in the 13 years he’s been competing. RTS Truck Driver Mark Hewitt (left) with RTS General Manager Chris Fada (right). Congratulations to Ross Transportation Services, Inc. (RTS) on achieving eleven years with ZERO Lost Time Accidents on March 14, 2018! This achievement means RTS drivers safely traveled, on average, 2,740 miles per day over the last year maneuvering through various road conditions, weather and interactions with outside drivers. This safety accomplishment could not have been possible without RTS’ world-class drivers, support staff of mechanics and exceptional administrative professionals. The Ross Group of companies, which includes Ross Environmental Services, Inc., Ross Incineration Services, Inc. and Ross Transportation Services, Inc., hosted their first-ever Holiday Open House on Wednesday, December 13th from 5:30 to 7:30pm. The family friendly event, aimed at bringing Ross associates, their families and neighbors together for a jolly good time. The night featured holiday music, hot cocoa and cookies for all, a Dear Santa letter writing station and more. Attendees were also able to snap photos with Santa and Mrs. Claus. Photographs were taken in front of a Christmas tree surrounded by presents donated by Ross associates to kids of all ages in Lorain County Children Services programs. This marks the 12th year the companies have participated in this program. Associates from all three companies sponsor a child and the purchases and wraps items on their wish list. Participants in the event included Eaton Township, Reed’s Salvage Corp. and the Ross Group of companies which includes Ross Environmental Services, Inc., Ross Incineration Services, Inc. and Ross Transportation Services, Inc.
Household hazardous materials were collected by the Ross companies free of charge to township residents and associates of the Ross Group of companies. Materials available for collection included paint, motor oil, household chemicals, discarded cleaning products and more. These household items are reflective of the types of materials that the Ross companies safely manage for customers on a daily basis. Over the last 28 collections, the Ross companies have collected and disposed of 128,770 gallons of household hazardous waste in an environmentally sound manner. Ross Foundation Inc. Announces 2017 Ross/Cromling Scholarship Recipient! The Ross Group of companies congratulates Julia Bestor, 2017 recipient of the Ross/Cromling Scholarship. Julia is the daughter of Ross Transportation Services, Inc. Truck Driver Don Bestor and his wife, Sally, who works as a Patient Care Coordinator at Avon Eye Design. The Ross/Cromling Scholarship is awarded annually by way of the Ross Foundation, Inc. The scholarship fund was created by associates of the Ross Group of companies, which includes Ross Environmental Services, Inc., Ross Incineration Services, Inc. and Ross Transportation Services, Inc., in honor of ownership to provide college funding to children, step-children and grandchildren of associates of the Ross Group of companies. Funds for these scholarships are generated through associate fundraising and donations. Scholarship recipients are selected by a Scholarship Selection Committee that includes five people representing community groups including: the Eaton Township Trustees, the Grafton/Midview Public Library, the Midview Local School District, a local financial institution and the Lorain County Community College. This year’s recipient, Julia Bestor, is a 2014 graduate of Water’s Edge Academy. She is currently enrolled at Mount Vernon Nazarene University and is working towards a degree in Biology. Julia is a member of the Alpha Chi National Honors Society and has made the Dean’s List at Mount Vernon Nazarene University from 2014 to 2017 with a 3.987 GPA. She has also been an active student assistant in her university’s Biology and Chemistry departments. Congratulations to Julia and best of luck in your studies. For more information about the Ross Foundation, visit http://bit.ly/RossFoundationInc. Ross Associates Announce 2017 Lorain County Fair 4-H Trash Barrel Painting Contest Winners! Local 4-H groups proved that a trash barrel is a terrible thing to waste as winners of the 2017 Lorain County Fair 4-H Trash Barrel Painting Contest were recently announced. This year’s event brought together a variety of 4-H groups in the 5-8 year old, 9-12 year old and 13-18 year old age categories. Club members worked to beautify worn 55-gallon trash containers, putting their own spin on this year’s 4H: Club, Community & Country contest theme. The annual contest, sponsored by the Ross Group of companies, Ross Environmental Services, Inc., Ross Incineration Services, Inc. and Ross Transportation Services, Inc., has been an esteemed affair of the Lorain County Fair for over 15 years. The contest gives 4-H club members an opportunity to showcase their creative and environmentally-conscious sides while offering them a chance to earn first place ribbons and $100 cash prizes toward their individual youth group. All entries were judged by associates of the Ross Group of companies for their neatness, creativity and conformance to the overall theme. This year’s first place winners were as follows: Belden B & G’s in the 5-8 year old category, Wildcat Wanderers in the 9-12 year old category and Brownhelm Perfection & B.B.’s in the 13-18 year old category. The winning trash barrels will be on display in the Junior Fair Barn for the duration of the Lorain County Fair. The remaining submissions can still be spotted by fairgoers throughout the Lorain County Fairgrounds when the 172nd Annual Lorain County Fair comes to town August 21-27, 2017. Congratulations and a job well done to all this year’s winners and participants! What We Do Matters® Fund helps Ross Associates Do What Matters in the Community! As a community-focused business, the Ross Group of companies is delighted to see our associates making a difference both in and out of the workplace through our What We Do Matters (WWDM) Fund! Ross Environmental Services Senior Communications Specialist Justis Clifford and Ross Incineration Services Welder/Pipefitter Dennis “Denny” Rourke are just a couple associates who recently made a contribution to their communities. By submitting applications to our WWDM Fund they were able to support two organizations near and dear to their hearts – the Friendship Animal Protective League (FAPL) of Lorain County and Amherst Girls Softball Association. As a member of the FAPL’s Board of Directors, Justis received a donation from the WWDM Fund to sponsor a table for the private, nonprofit humane society’s Wags to Riches Casino Night. The affair is the organization’s largest with a fundraising goal of $60,000 and proceeds helping to continue the shelter’s mission of rescuing, rehabilitating and finding forever homes for companion animals throughout Lorain County. Denny also gained a WWDM donation to support the Amherst Girls Softball Association and its annual Night at the Races event. This marks the second time Denny has submitted an application, over the last two years, to the WWDM Fund to support the softball association and his daughter, Britnee, who plays for a softball team within the group. Since the fund was put into effect two years ago, 28 associates from the Ross Group of companies have received donations to support local organizations in which they or their family members are involved with.